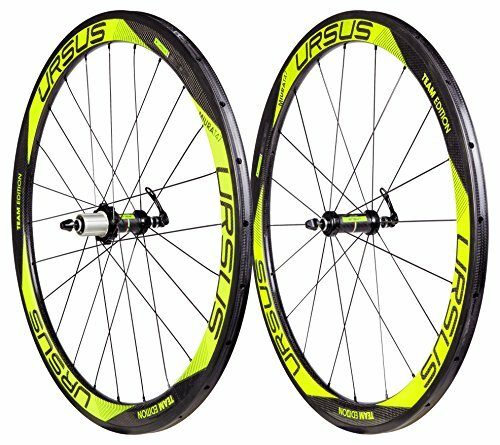 Ursus Miura T47 Carbon Tubular Wheelset are designed for triathlon, road and cyclocross racing as neatly aggressively driving on each flat roads and mixed terrain. Ursus Miura T47’s 3k monocoque carbon rims contain two special technologies – HPS and HTG – to cut back Warmth at the same time as braking and build up the efficiency and sturdiness of the wheels. Ursus carbon-aluminum hubs (RCS24F/RCS24R) be offering silky-easy responsive efficiency with less friction and instant energy switch. These Italian-made wheels are utilized by most sensible skilled racing groups and well known cyclists like Mario Cipollini, Alessandro Petacchi, Davide Rebellin and Filippo Pozzato. Reliability, energy and stellar efficiency are some great benefits of these Ursus MIURA T47 wheels. Made in Italy. Wheelset comes with Entrance wheel, rear wheel, Ursus WB05 QR skewers and Swiss Prevent Black Prince brake pads (F/R). Compatible with Shimano/SRAM 10/eleven speed cassette (no longer included).